Night gathers and now my watch begins, it shall not end until my death. 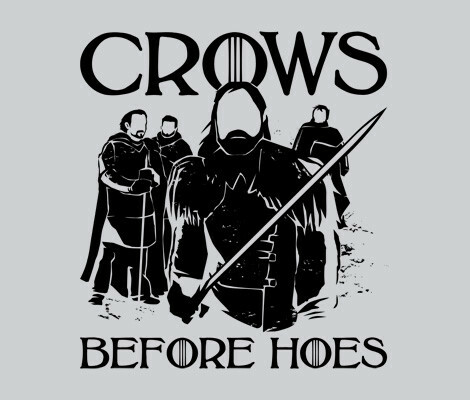 I shall take no wife, hold no lands, father no children. I shall wear no crowns and win no glory. I shall live and die at my post. I am the sword in the darkness. I am the watcher on the walls. I am the shield that guards the realms of men. I pledge my life and honor to the Night's Watch, for this night and all the nights to come. Or until the premier of season seven gets on TPB. (Don't judge me, if I could watch it legit I would! It's not my fault HBO hates the UK) It's about 2 hours until it airs in the US so ~ 3-4 hours until I get to see it so I'm pulling an all nighter! I read the first book in 2010/2011, back then there were only 3 books out and no TV show! When I read the first book I was 16/17 (I think?!) and it's been my obsession ever since, (remember the blanket?) basically if something's going down in Westeros I know about it. I was lucky enough that I finished reading the first 3 books just around the time the show was first aired, and the 4th book published. 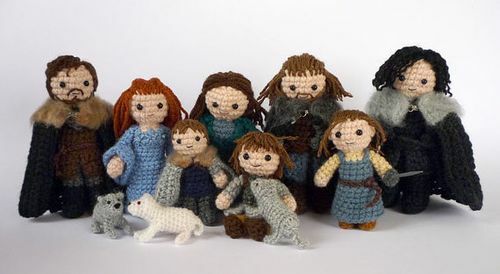 I was super excited during season one (I am also a bean stalker so Sean Bean as Ned made me both very happy and very sad) and think in general the show has done a great job of bringing the books to the screen (mostly... *COUGH*dorneplot*COUGH*) So you can imagine my distress at the realization this year that I would have to wait more than a year for any new content, this was compounded by GRRM pushing back the Winds of Winter until late this year/early next year, so I've been DYING for this episode. Hence the late night. 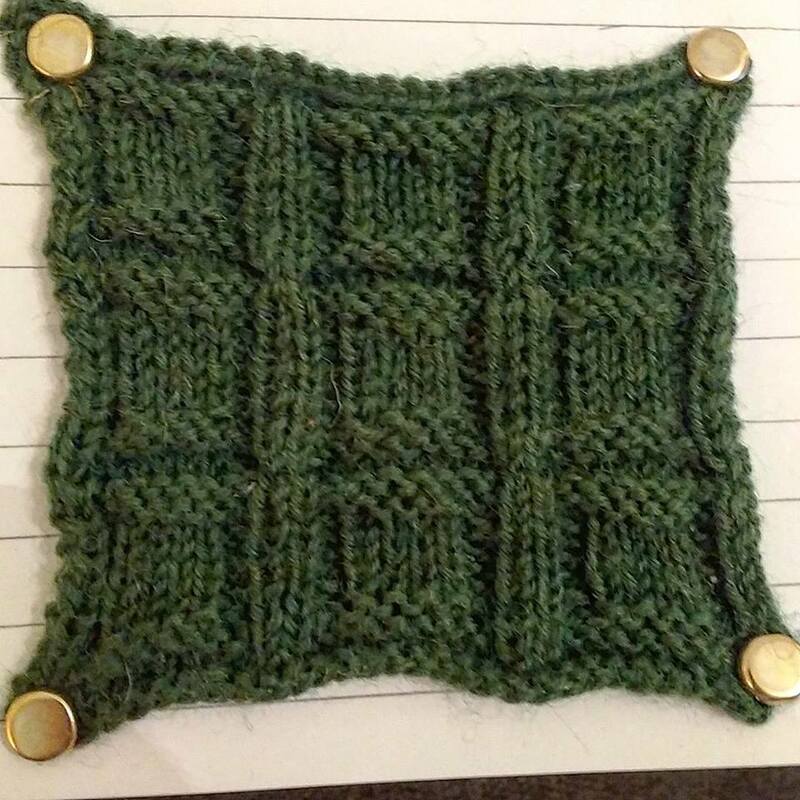 But you aren't here to hear me rave about possibly the best fantasy franchise of the 21st century, no you wanna know about the knitting game so here we go. It's a blocky pattern that reminds me of windows. The reverse is embossed squares. Jeeze that was underwhelming maybe I should do something else. Oh! I have finally written up the entire first chapter worth of swatches, so you lucky cluckies will be glad to know that because I'm going to be up so late I'm going to schedule a bunch of stitches in advance. So there will be daily updates, so long as I can be bothered to write/take swatch pictures tonight. I think this pattern would benefit from blocking perhaps more than others. 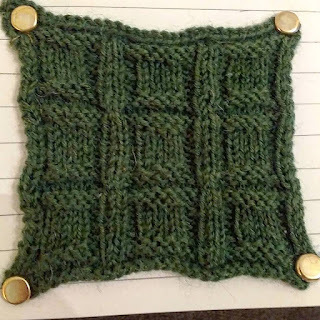 I don't tend to block the swatches as the extra work involved often isn't worth it for such small objects that don't need to be a perfect shape and often stitch patterns look best unblocked but the welts in this one tend to curl a lot compared to the purl ribbing gaps. Idk Barbras looks much better and perhaps it's because it's blocked. Well That's the first post written up on with the next. Happy Knitting!